The new “Creative MN” report on the “Impact and Health of the Nonprofit Arts and Culture Sector” was released last Thursday, and it has some amazing numbers, statistics and charts. In aggregate, the sector is doing amazingly well, and adds so much to the vitality of our state and region. We should be very proud of the achievement of the Arts in Minnesota. 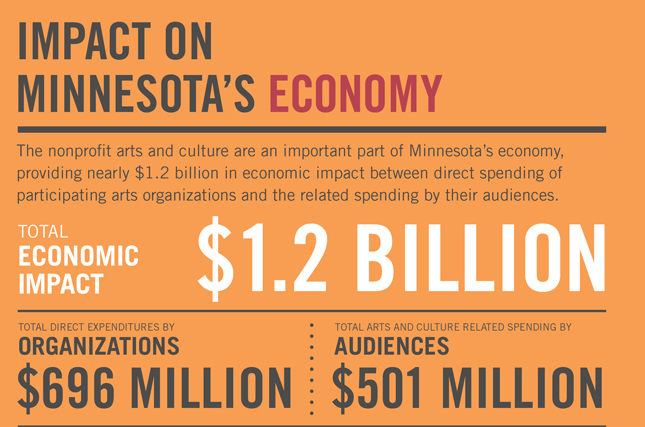 Images and statistics are from “Creative MN: The Impact and Health of the Nonprofit Arts and Culture Sector,” a report researched and published by Minnesota Citizens for the Arts. It is truly amazing and groundbreaking. This post is not a criticism of the report or its uses, but another view of what we can learn from the data. Please visit www.creativeMN.org for the full report. It is clear from the report, that the State of Minnesota is reaping enormous benefits from its investment in the Nonprofit Arts and Culture Sector. For an investment of $81 Million through the State Arts Board and Regional Arts Councils, over $100 Million is returned to the State in tax money! That’s an amazing investment that argues not just for continued funding at current levels, but increased funding across the board. Where else can you get a 25% return on investment in a single year? In the rest of this post, however, I will try to look at some of the numbers from the other side: How are workers in the sector doing? And how does that impact the real health of the sector? I think it is very important to understand what the numbers mean and what they do not mean about the health of the field. First, the headline number: $1.2 Billion. This is a big number, and places the nonprofit arts and culture sector among the largest “industries” in the state of Minnesota. The report breaks that big number down: $696 Million spent by Organizations and $501 Million in related spending by Audiences that is beyond the price of the ticket. Looked at in another way, just under half of the $1.2 Billion generated by activity in the Nonprofit Arts Sector is spent outside the sector. The dollars benefit the community and the state in many ways, but those dollars do not directly benefit the Arts Sector. Those are spent because of arts events, but the dollars benefit the restaurant, hotel, transportation and other ancillary sectors. Why this matters is while the $501 Million spent by audiences helps to pay the salaries of many Minnesotans, it does not help pay the salaries of employees of the Arts Sector. A couple of other important numbers in the report have to do with employment: more than 33,000 Full-Time-Equivalent (FTE) positions, paid over $827 Million dollars. Again, these are big numbers, but combining this info with the analysis above, suggests that a large number of those FTEs and millions, are earning their salaries because of the Arts Sector, but not actually within it. The jobs number seems to include employees and dollars that exist within the $501 Million realm, as well as the $696 Million realm. Again, why this matters is that at least for understanding the health of the Nonprofit Arts Sector itself, and the 1,269 organizations surveyed within it, this larger number may seem to overstate how well the field is doing in supporting the workers within it. There is another number in the report that may help pull out the employment numbers from the amount spent by Organizations, and that is the “Expenses by Category” number. The total there is $461 Million. If we assume that about two thirds of those expenses are personnel, with the other third being other program expenses, facilities expenses, materials, etc., then about only about $305 Million of the $827 Million total salary number is actually paid to artists and employees of arts organizations. 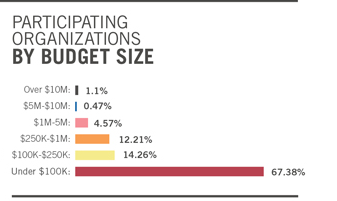 But we also see that 67% of those 1,269 organizations have budgets under $100,000, so there’s no way that the mean averages are terribly instructive. I would posit that very little of the salary is paid to those employees of those 875 organizations under $100,000 budget. This is a lot of numbers, and I need to dig further, but if you lop off the executive salaries of the largest organizations that throw the curve off, this suggests that a very large number of full time workers in the arts sector are earning between minimum wage and $12.00 per hour. But the health of the sector, in terms of how well the workforce is supported, is not very good. 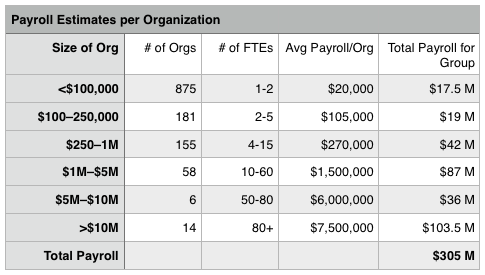 The majority of the 12,000 FTE employees of the 1,269 organizations surveyed are paid no better than baristas and fast food workers. This leads to turn-over, burn out and instability for the small to mid-sized groups who see their most ambitious and talented workers move up and out of their organizations. I would argue that for the true health of the Arts Sector, we need to find a way to compensate the talented, often young, employees who have a passion and drive for their art much better. While the sector brings great returns to the State, it’s clear that it is under-resourced for sustainable health.